Let and let be a univariate t distribution with degrees of freedom. where is the multivariate Student’s t distribution with a correlation matrix with degrees of freedom. Generate a multivariate vector following the centered t distribution with degrees of freedom and correlation matrix . Transform the vector into , where is the distribution function of univariate t distribution with degrees of freedom. To simulate centered multivariate t random variables, you can use the property that if , where and the univariate random variable . where denotes the degrees of freedom of the t copula, denotes the joint density function of the centered multivariate t distribution with parameters , is the distribution function of a univariate t distribution with degrees of freedom, is a correlation matrix, and is the density function of univariate t distribution with degrees of freedom. 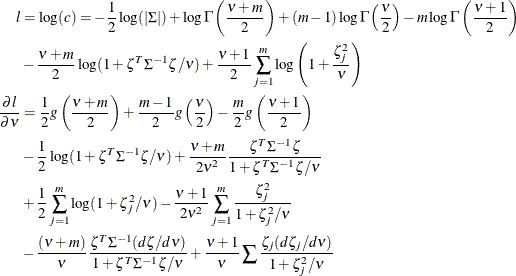 The log likelihood can be maximized with respect to the parameters using numerical optimization. If you allow the parameters in to be such that is symmetric and with ones on the diagonal, then the MLE estimate for might not be positive semidefinite. In that case, you need to apply the adjustment to convert the estimated matrix to positive semidefinite, as shown by McNeil, Frey, and Embrechts (2005), Algorithm 5.55. Compute the eigenvalue decomposition , where is a diagonal matrix that contains all the eigenvalues and is an orthogonal matrix that contains the eigenvectors. Construct a diagonal matrix by replacing all negative eigenvalues in by a small value . Compute , which is positive definite but not necessarily a correlation matrix. Apply the normalizing operator on the matrix to obtain the correlation matrix desired.